For the everyday consumer seeking more functionality and the ability to complete tasks efficiently and effectively, Curo provides a richer, more satisfying user experience. For seniors (50+) who find complicated mobile screens full of tiny icons difficult to read and understand, Curo offers simple, intuitive, easy to use devices that reduce their frustration. For physically or mentally challenged people who require specially designed user interfaces, the Curo solution places lower comprehension, cognitive and dexterity demands on the user. For visually impaired people, the Curo audio browser provides the benefit of navigating the menu features without needing to see the phone display and keypad. The Curo "user centric" design solution best matches the most basic human skill sets. It provides intuitive functionality by orally prompting and guiding the user to complete simple, specific tasks one binary decision at a time. The user quickly learns the device's simple, predictable behaviour, further reducing the learning curve of complex standard visually-based mobile interfaces. 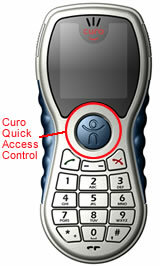 Curo’s user interface enables users to operate mobile phones with the Curo Quick Access menu navigation control button. To access specific phone functions and menu items, users simply listen as the phone presents its features, and then click the Curo navigation button to select their desired feature ... it’s simply enabling! Curo users, their friends and their families enjoy unprecedented communication, security and entertainment. This amazing user interface technology breakthrough will attract many new consumers and lifestyle application solutions to the cellular industry. Curo products utilize subtleties of human audio interaction to provide pleasant, artful communication, security and entertainment in an elegantly small, yet cleverly sophisticated package. As the world becomes more conscious of social responsibility, Curo provides the wireless industry with socially enabling solutions.